This system was mounted on a south-southeast facing roof that is tilted at 35 degrees. 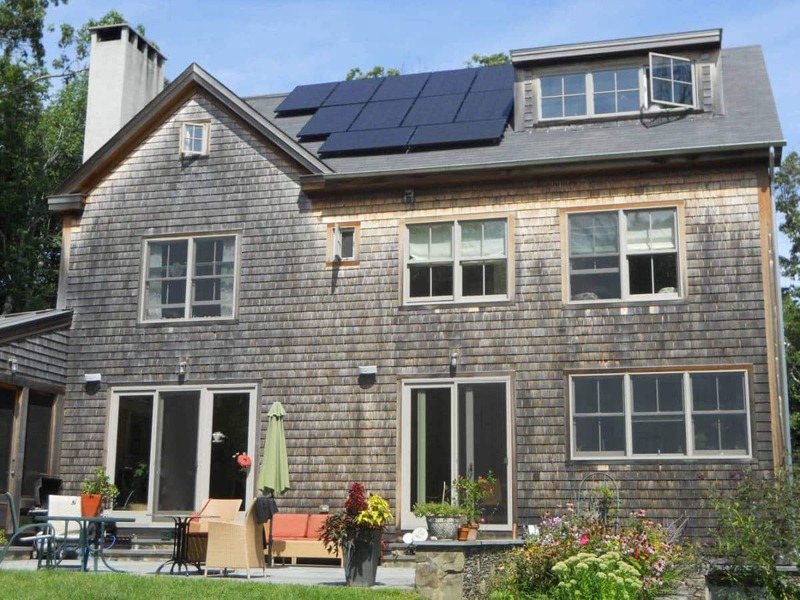 Roof size constraints kept the system from being sized to offset 100% of the electricity usage. All black panels were used to blend well with the asphalt shingle roof. The installation fits between a dormer and gable with minimum shading. A single conduit run leads to the back-fed 100-amp panel. This installation combined landscape and portrait orientations to maintain aesthetics and maximize the use of available space. Matching the panel layout to the roof shape lead to a great looking installation with minimum shading. The conduit run was hidden behind the chimney. The grant covered 25% of the installation cost per the previous Renewable Energy Fund requirements.